First order of the day was to check out. The conference being over today, we couldn't justify our luxury hotel any more. We left our bags and Cath went to the conference and the free coffee there whilst I went to a branch of Tully's, another local coffee outlet. I sat, read, wrote and listened to the eclectic mix tape the store played. One track was in Dutch by great Dutch band Bløf. 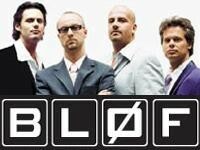 It seemed unlikely to be listening to Bløf so far from Bløfland but I'm sure a local music journalist could explain it in terms of the local music scene. I picked up some lunch-like things from a Chinese bakery and wandered through some more of the market. I watched some more fish being thrown, a giant squid being abused and tourists being scared with a monkey fish, before heading back to Tully's. While I was in there the second time, the chairs were replaced. Two burly, not-too-much-nonsense guys came in and replaced the chairs around as people sat and drank coffee. I assume they were official and not part of some elaborate plan to steal old chairs leaving newer ones in their place. I'm glad I was there when it happened, because even though the new chairs were quite different, I doubt I would have noticed whatsoever had I come back after the fact. I like to think I am that observant, but men don't notice the minutia like women do. Minutia like new chairs, new shoes, changes of hair style or colour. Actual lunch was a plate of Thai food served by a Middle Eastern man. I had it with that exotic Thai drink, Dr Pepper. Actually I had the Dr Pepper because I never see it and there was a stage, when I was knee-high to something mid-sized, that it was my favourite drink. I am way taller than that thing now and Dr Pepper is just a quirky cola that you only find in unexpected places. Although I hear that in some quarters it is still popular and people even drink it warm. I kid ye not. In full conference husband mode, I made myself feel better about not being the main bread-winner by visiting the hairdresser. My hairdresser (or barber, as he corrected, although he had been a hairdresser) was originally from Mexico but eventually found his way to Seattle and has been cutting hair for 25 years. Because of the length of my hair his first question was if I was a musician. Nope, lazy comedian. Being a Seattle barber, he'd cut a few rock star hairs, including members of Nirvana and, one time, Kurt Cobain. Were I the type, I would have said "wow" and been part-, full- or even over-awed. It was at least a cool thing to tell the kids back home. And to tell the truth there is a modicum of awe as it is my closest, if somewhat tenuous, connection to a dead rock star whose work I do admire. I guess closest connection apart from seeing his widow in concert. The barber asked an innocent question at the end about if he wanted it cleaned up underneath. I said, "yes" expecting some clipping action under the back of the hair. Instead he got out the vacuum cleaner and hovered up the back of my hair! I'm not sure if it was just a local thing or something only he does to dumb tourists, but it certainly was a first. Sporting my new post-grunge locks, I grabbed an iced decaf latte and skipped over to the conference centre and used the free internet until Cath came and only just recognised me. We carted our stuff over to our new hotel on Pioneer Square. Coming from the old one with it's fluffy bears, four-poster beds and real coat hangers, there was a period of adjustment. 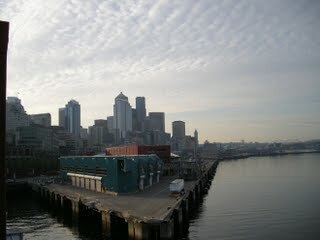 Our view was now of a blank wall instead of Puget Sound (it's a kind of bay). We seafooded at McCormick's and of course saw a rat on the way home. A gallery a couple of doors down from the hotel was preparing itself for something big. That thing, explained an emerging artist, was the next day's art walk. The artist added that he worked a lot with larva and insects and they seemed as much the creators of the art as he was. We said we'd try and come by, and maybe shake antennae with a few of them. We didn't make it.